Under an arch on the right (north) side of the grottoes, is the tomb of John Paul I, Albino Luciani, whose pontificate lasted on 33 days and who died on September 28, 1978. The Fabbrica of St. Peter's commissioned the sarcophagus designed by Francesco Vacchini and the pope was buried on October 4. The tomb is a massive and linear parallelepiped with a slightly slanting lid. 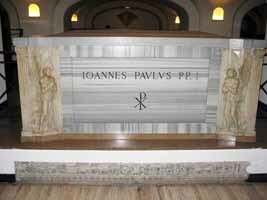 Engraved on the front is the monogram of Christ and the name of the pope IOANNES PAVLVS PP. I. The decoration makes use of the contrast in tonality between the gray veins of the Greek marble: horizontal in the center and vertical on the frame. Striking in this chromatic context are the two ancient reliefs of praying angels on the sides of the front. They come from the facade of the Renaissance tabernacle of the Holy Lance, commissioned in 1495 by Cardinal Lorenzo Cybo, by order of his uncle, pope Innocent VIII who received the famous relic in Rome. The two gracious angels with the opened wings and arms crossed on their chests were originally turning toward the Holy Lance. They are attributed to the late workshop of Andrea Bregno. Pope Benedict XVI prays in front of the tomb of John Paul I, in the crypt of St-Peter's basilica at the Vatican 02 November 2005, for the day of the dead.